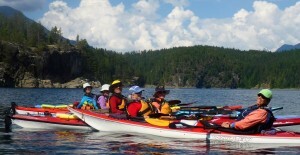 SKABC organizes a range of trips for its members. Trips vary in difficulty and length from a few hours or day trip, to weekend trips, to multi-day trips. Most trips have destinations around the lower mainland and Gulf Islands of BC, but they could be as far a field as Haida Gwaii or Baja Mexico. Our trips are a great way to learn from each other, make new friends, develop your skills, and discover new destinations. Please note that SKABC trips are not guided trips; nor does SKABC provide any equipment. Rather, our approach is that we are a group of common adventurers who share the responsibility for making the trip a success. As a participant, you are responsible for your own safety. The difficulty of a trip is indicated by the trip classification code in the trip title, for example, (B2). Refer to the Trip Classification Chart to understand the code and determine if you have the necessary skills. If you're not sure, contact a Trips Officer to discuss. Wear a Coast Guard approved personal floatation device (PFD) and carry all gear recommended in the Gear Checklist. Have recently practiced self and assisted rescues. Be ready to launch at the agreed upon time. Pack the appropriate food and clothing to maintain an optimal level of comfort throughout the trip. Travel with the group throughout the trip. Note: Trips are available to SKABC members only. Not a member yet? Join us. If you're a member already, Click Here to login. Log in to the SKABC with your Username or Email and Password. Find a trip in the Trip List. Check the trip classification code and review any other participant requirements that may be specified for the trip. If you have any questions about the trip, or equipment, skills or stamina required, discuss it with the Trip Leader or a Trips Officer. Fill in the signup form. It will be submitted to the trip leader for approval.